Stylish savings are at your fingertips, whether you’re looking for a weekend escape, spa getaway or business retreat. Spend your Easter holiday in a fun filled weekend getaway in the heart of Jakarta. Enjoy a memorable weekend getaway without having to leave the city! Valid book from 4 January 2019 until 30 June 2019 for stays on the weekend (Friday, Saturday, and Sunday). 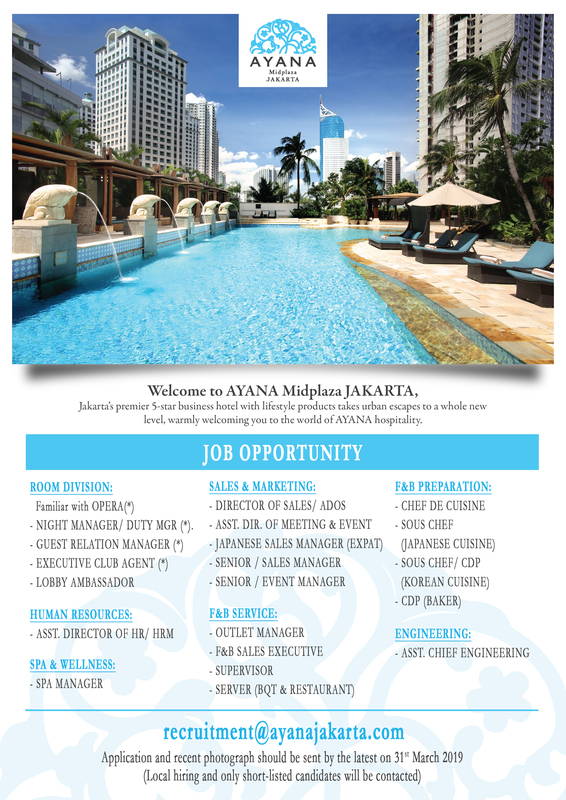 Experience the AYANA Midplaza, JAKARTA hospitality while hosting a successful meeting in the heart of Jakarta. Valid book and stay period until 30 June 2019. Look sharp and feel your best with a minimum 2-night stay in our Deluxe room or Premier room during your next business meeting in Jakarta. As a special VIP perk, you'll receive special benefits about this offer. Perfect for weekend getaways and special occasions, stay for a minimum of 2 nights in our spacious Studio Suite and receive 20% off your room rate. Treat yourself to an urban golf escape! Your package includes a comfortable one-night stay in a Deluxe Room, as well as a relaxing round of 18-holes at Riverside Golf Club. Packages are available until 29 December 2019. To live well is to dine well, so let’s celebrate life to the fullest with special offers at our award-winning restaurants & bars. Indulge your senses with healthy foods selections, showcasing Chef's signature specialties and revitalizing drinks. Our Mixologist presents a delicious array of Vodka-based cocktails selections at JimBARan Lounge. Enjoy complimentary sumptuous tapas selection for every purchase of our Mixologist's crafted alcoholic beverages while spending your time with great friends and colleagues after work in a lively ambience.